Sports mascots are like clowns; some people embrace them and some run away as fast as they can. At half-time on February 29, 2016, the Los Angeles Clippers basketball team introduced its new mascot, Chuck the Condor. Initial reaction has been mixed, with several pro sportswriters hating Chuck and some fans (no doubt with young children or young hearts) loving him. From a marketing point of view, the most successful mascots are those that are relevant to the image of the team and its story. Bailey the Lion, the mascot of the Los Angeles Kings hockey club, is a strong example of a relevant and popular mascot. Image-wise Bailey is right on target; what better choice of animal than a lion for a team called the Kings? Bailey also represents the personality of a stereotypical hockey player, wild and aggressive on the ice and cuddly and sweet off of it. He may roar at the opposing team, but he’s not going to frighten any children when he visits hospitals. On the other hand, Chuck seems made of whole cloth, without a strong relevance to the Clippers. Yes, he’s a California condor, a majestic bird with a huge wingspan (a widely used term for a basketball player’s long arms) but the team is named after the city of Los Angeles, not the state. Ironically, the condor is still an endangered species, a condition more descriptive of the current cellar-dwelling Los Angeles Lakers than a Clippers team that has been reborn over the last few years. By becoming a playoff contender, the Clippers have managed to transcend their old image as perennial losers. 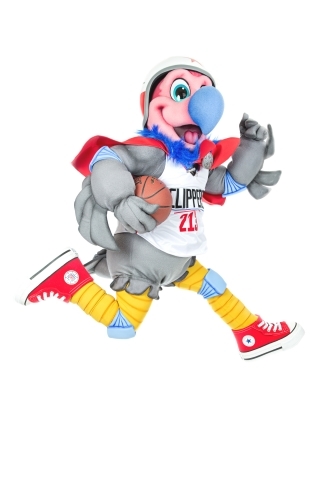 Will Chuck the Condor find his way in the competitive world of sports mascots and sports marketing? I see good prospects for sales of little stuffed Chucks, but beyond the kids this condor may have a tough time. I am not a sports guy and I certainly am not an expert on mascots. I was, however, scratching my head when I first read about the Clippers’ choice. Not only could I not think of a connection between the Clippers and a condor but I am amazed that no one made the connection with a bird getting its wings “clipped” and therefore being unable to fly (mammoth wingspan notwithstanding). I guess it could have been worse, albeit more literal. Their new mascot could have been a cute and cuddly pair of scissors. Story is the mother of brand and as you pointed out they must both be connected to resonate in the minds of their audience. This condor is earth bound and will never soar unless there’s a strong story to make him fly.